There are few things as refreshing as a sunny morning in Austin, surrounded by fresh produce, colorful bouquets, hot coffee and the sound of a local musician wafting through the stalls at one of our many farmers markets. Whether you&apos;re in town for a few days or a few weeks, a visit to one of our area markets is a great way to have the authentic Austin experience. In total, there are more than 40 markets in and around town every week but to help narrow down the list, we have put together a list of some of our top weekend markets in Austin. So get up, get outside and get shopping! SFC Farmers&apos; Market. Courtesy of the Sustainable Food Center, credit Buff Strickland. SFC Farmers’ Market Downtown, Saturdays 9 AM – 1 PM Every Saturday morning, this massive market transforms Republic Square Park into a lively community of locals, visitors, students, families, farmers, artists, musicians and more. Browse food, drink and arts vendors selling everything from farm-fresh eggs to locally-brewed kombucha. Paleo Farmers Market, select Saturdays 9 AM - 11 AM If you&apos;re looking for an authentically Austin experience, visit local paleo coffee shop and cafe, Picnik, for their small monthly farmers market at the South Lamar location. Come to pick up paleo provisions for your visit (order ahead here) and stay for the famed butter coffee and breakfast tacos. Barton Creek Farmers Market, Saturdays 9 AM – 1 PM This market is located at the Barton Creek Square mall and boasts a fantastic view of the downtown Austin skyline. Enjoy live music while you explore the vendor booths selling freshly baked breads, Fredericksburg peaches (during late spring/summer) and other organic, farm-fresh goods. HOPE Farmers Market, Sundays 11 AM – 3 PM Experience the authentic East Austin community at the HOPE Farmers Market on Sundays. This compact market packs in the energy with live music on the picturesque Plaza Saltillo, an array of vendors, handmade jewelry and apparel artisans, food trucks and free yoga. Texas Farmers Market at Mueller, Sundays 10 AM – 2 PM Make a Sunday morning trip to the idyllic Mueller Lake Park for this Texas-sized farmers market. Situated across the pond from the Thinkery children&apos;s museum, the market boats a food truck park in addition to the selection of food and craft vendors. Don&apos;t miss the Prickly Pair Farm stand for a colorful bouquet and Meridian Hive Meadery for a taste of their hand crafted honey wine. 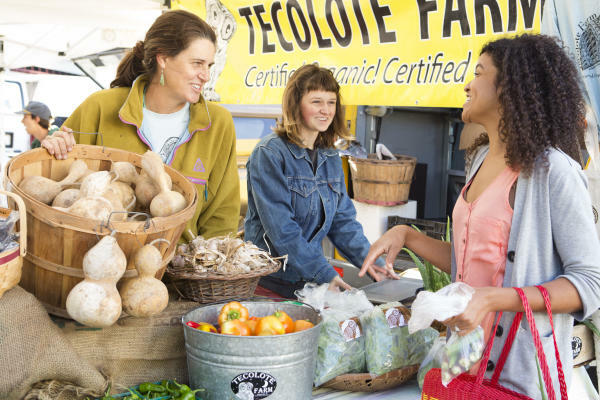 SFC Farmers Market at Sunset Valley, Saturdays 9 AM – 1 PM This sizable south Austin market is a Saturday morning staple. Let the kids play at the Imagination Playground station while you pick up an organic roast from Texas Coffee Traders, homemade tamales, seasonal fruits and veggies and more. Share your farmers market snaps with us using #TrueAustin on Twitter or Instagram!